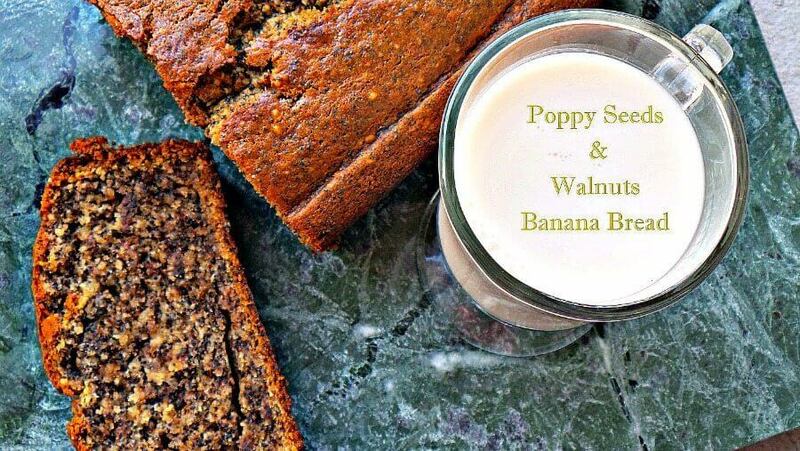 Poppy Seed Walnut Banana Bread is soft, dense and full of flavor poppy seeds. 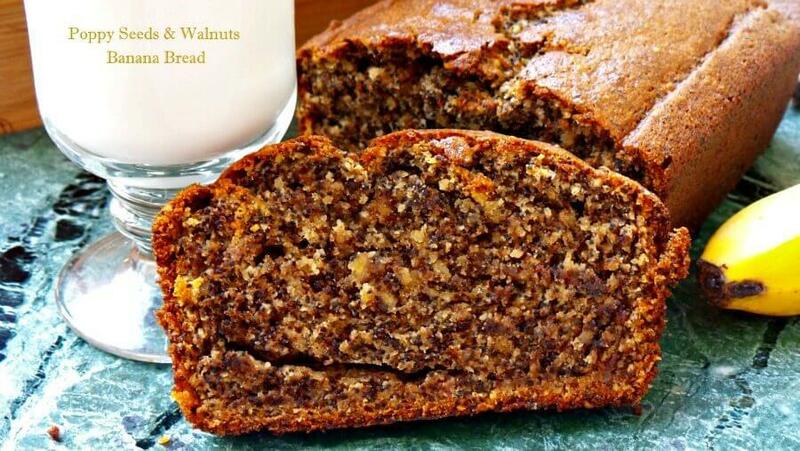 This walnut banana bread is great as a snack, breakfast or dessert. 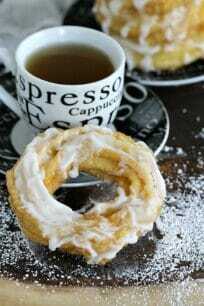 Easy to make and heavenly delicious. I love making tender and puffy Breads like my popular Chocolate Banana Bread, Skinny Blueberry Banana Bread and Lemon Poppy Seed Bread. 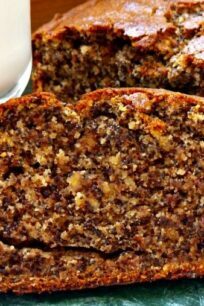 Poppy Seed Walnut Banana Bread is very soft, not too sweet, very dense and deliciously moist bread. It is one of my all time favorite snacks or quick breakfast. This poppy seed walnut banana bread contains lots of banana flavor, which pairs well with the poppy seeds. I added some grinded walnuts, which I happened to like more than when they are just chopped. Grinding them helped add extra depth to the dough texture, some subtle nuttiness and a heavier, stickier crumb. I also went heavy hand with the poppy seeds, to get some nice crunchiness, extra flavor, and it just makes the bread look so much more appetizing. It is rich in walnut and banana flavor, which makes it a show stopper dessert. Easy to find ingredients and minimum prep work and dishes to clean. Perfect for brunch parties and for bigger crowds. Easy to transport if you have to take it to a brunch party. 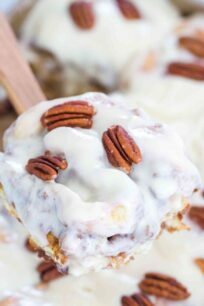 Can be made 1 or 2 days in advance so you don’t have to worry about a last minute dessert. How should I store Poppy Seed Walnut Banana Bread? The bread can be stored wrapped in plastic wrap at room temperature for up to 4-5 days. Can I freeze Poppy Seed Walnut Banana Bread? Absolutely. This bread also freezes well. Cool the bread completely and fully wrap it in plastic wrap, very tightly. After that wrap it in aluminum foil. Freeze for up to 1 month. Defrost before slicing. Preheat oven to 350F. Grease a loaf pan with butter (2 tbsp.). In a high speed mixer with the paddle attachment, cream together the yogurt, sugar and butter until well mixed. Add in the egg, vanilla extract & mashed bananas, mix until smooth consistency is achieved. Stir in dry ingredients – flour, baking soda, baking powder, salt and add to the mixture. Grind the walnuts until a crumble like texture is achieved. Using a spatula, carefully fold in the walnuts & poppy seeds. Bake for 60-75 minutes or until a wood tester inserted in the center comes out with only a few moist crumbs attached. Transfer the pan to a wire rack, and let it cool completely before serving. 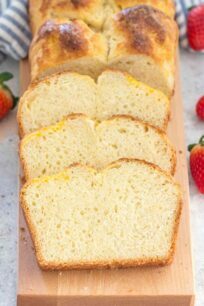 This looks delicious, I really like banana breads, especially since they’re so easy to make. I never thought of adding poppy seeds though. I think I’ll try your recipe next week, I have plenty of walnuts that need to be put to good use. I love this idea! Walnuts are so good for you. It’s the perfect addition to the bread!